Holidays are always the worst for singletons. Whether it's just being alone or having just gone through a poorly timed break up, there's nothing worse than seeing happy couples laughing and holding hands skipping down the sidewalk. It is almost as if they come out of the wood work just on holidays. So why not make yourself that special someone? 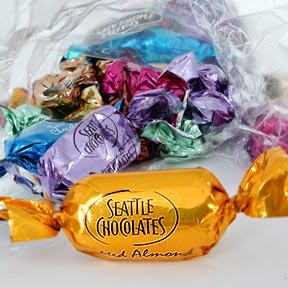 This brightly colored bag of truffles from Seattle Chocolates is sure to bring a smile to your face. And all the delightful flavors will make even the pickiest connoisseur happy. Each chocolate comes wrapped in a brightly metallic foil that makes a provocative crinkly sound when you open them to reveal a perfect, bite sized chocolate shaped like a little loaf. And despite the size, you'll find each truffle packs a big flavor punch. Plus, the truffles are just exactly the right size that it's impossible to feel guilty say, even if you inhale the whole bag accidentally. If you're looking for a little crunch may we suggest the Toffee, Salted Almond or Peanut Brittle. There is just enough of a crumbly crunch in each of these so you get the right amount of texture that you end up frantically searching the bag for just one more bite. Thankfully, the wrappings are all color coded and labelled for good measure. For the chocoholics who enjoy the classic fillings, the Milk Chocolate Mint, Cool Mint or Peanut Butter will satisfy your cravings and, Seattle Chocolates has a whole bevy of brightly naturally flavored, fruity fillings all tinted just so that when you bit in, you see a slight blush from the fruit; Blackberry Crème, Strawberry Crème and Raspberry Crème. And if you think that's it how about the Coconut Macaroon, Espresso and Sea Salt for the more adventurous? I used to think if I was left on a deserted island and I could bring one thing it would be Mascara, that or Ryan Gosling. 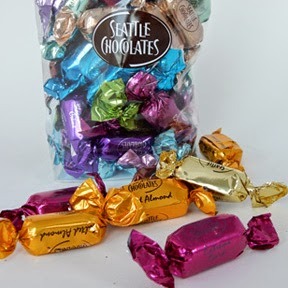 But now I think I would be perfectly happy with a bag of assorted Seattle Chocolate Truffles.